International cricket returns to the North West this week for the first time in over a decade. Tomorrow, Friday and Sunday Ireland face Scotland in a T20 International Series at Bready. Five North West Warriors - Andrew McBrine, Stuart Thompson, Graeme McCarter, Craig Young and David Rankin - are in the squad and for pace man Young it will be a dream come true if selected to play at his home ground for his country. The 25-year-old has already forgotten about the World Cup, where rather surprisingly he didn’t play a game, and has come back and picked up wickets for club, province and country. Young also concedes that he’s loving his cricket at the minute and would love to get a chance to bowl against the Scots this week. “It’s brilliant to represent your country and it’s even better if selected to do it at home,” he said. “It’s something whenever you were a kid you always dreamed about it happening and hopefully this isn’t just a one off, this is the start of something. “We definitely pride ourselves here in the North West about having the best supporter, so hopefully the weather stays good and we get the crowds that we are expecting to come to Bready. Everyone in the North West and Irish cricket in general were stunned that then coach Phil Simmons didn’t give Young a bowl at the World Cup in Australia and New Zealand. 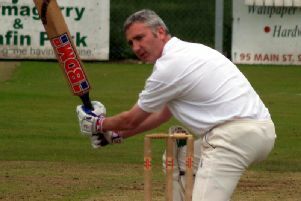 However the former Sussex man hasn’t let it bother him and he will be hoping his recent form against Scotland continues. The Scots have been happy opponents for Young, who has 18 of his 37 international wickets to date against them, including his best ODI figures of 5-46 at Malahide last year. “Since the World Cup for me nothings really changed,” he added. “I always keep my head down and work hard, play each game as it comes. Only recent new coach John Bracewell praised the pace bowler after his super display against the UAE, but the modest Young just took it in his stride. “Yes it’s nice that the coach said a few nice things about me but I’m not going to get too excited,” said the NW Warrior. “It’s a nice confidence boost but I have to admit that I don’t really take those things to heart too much. While another Bready native Rankin - younger brother of Boyd - won the T20 Inter-Provincial player of the tournament last season. He has played for both Ireland U19’s and Ireland A, but this is his first call-up to the senior ranks. The 27-year-old was surprised but naturally delighted with his inclusion: “It came out of the blue to be honest but I was naturally delighted to get the nod,” said Rankin. “It’s a great honour to be called up but the fact that the series is being held at Bready and with Craig (Young) involved too makes it extra special. “I have been happy with my form overall but especially the T20 stats in the past couple of seasons. Club and Inter-Provincial cricket are equally important to me and I’m delighted to be given this chance at full International level. Rankin is included in the squad for Thursday’s game only, as Andrew Balbirnie will return from Middlesex commitments on Friday. Tickets for the games are priced at just £5 for adults, £4 for OAPs and U16s are free. Cricket Ireland also have a Special three-match package for £12. There is plenty of entertainment on each day with food and drink offers on each night and all the action gets under way at 5.30pm. h tomorrow and Friday, while Sunday’s start time is 2pm. Further details are available on www.cricketireland.ie.